Rising inventories will result in lower prices. The clearest example currently is crude oil. 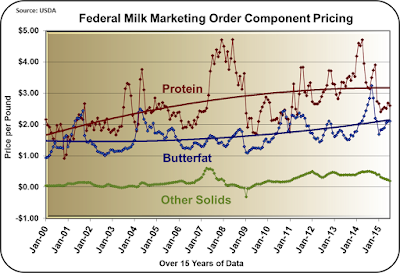 The inventories of the commodities used to price milk protein, butterfat, and other solids are increasing. The most important of these is cheese. 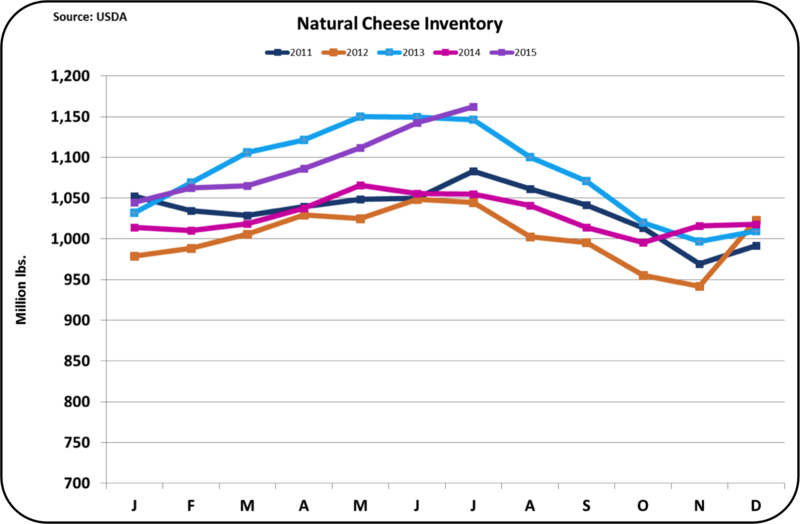 Below are graphs of the recently released data on cheese inventories. Inventories of both natural cheese and American cheese are up significantly. In the prior post, data on cheese exports and imports was reviewed. Exports were down and imports were up. While cheese exports to Mexico remain very healthy, exports to the next two largest importers, Japan and South Korea, are off significantly. 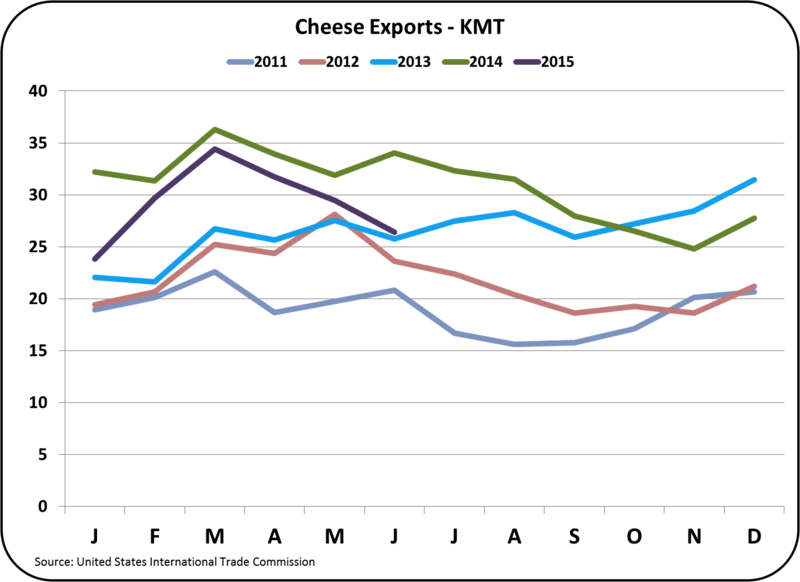 The focus in prior posts has been primarily on the decrease in exports, but the increase in cheese imports has also been impactful. 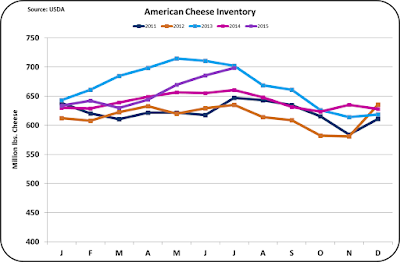 Through July 2015, YTD cheese imports are up 30%, or 12,237 metric tons. 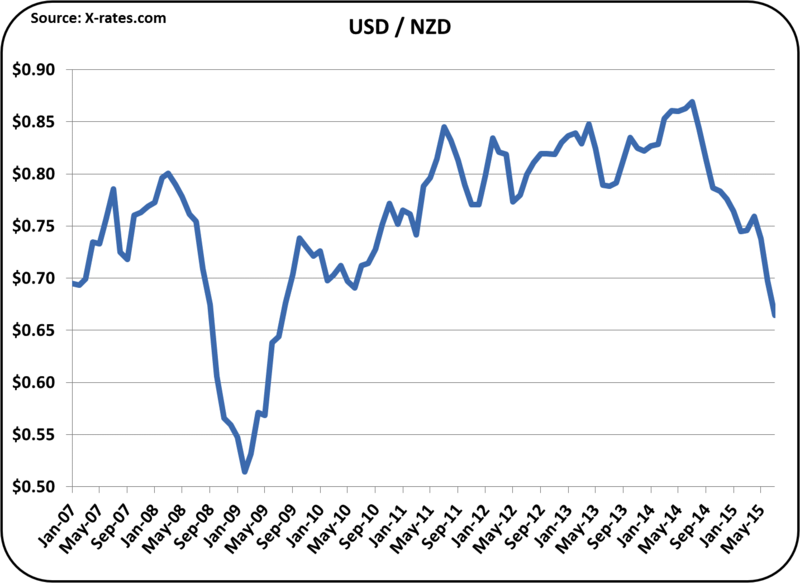 The single biggest import increase was cheddar cheese from New Zealand, which for the first seven months of 2015 was up from 372 tons to 3,925 tons. This was an increase of 3453 metric tons. Similarly, New Zealand's "other cheeses" import category increased by 3181 tons. That makes the total imports of cheese from New Zealand in excess of 6634 metric tons. Clearly, the "majority" of the increased cheese imports are coming from New Zealand. Converting from Metric tons to pounds, the year to year import growth amounts to 27 million pounds of cheese. During this time, natural cheese inventories have increased 144 million pounds. The increase in cheese imports are responsible for 19% of the total inventory increase. Why are these imports up? Simply because they can be imported less expensively than if they were sourced domestically. 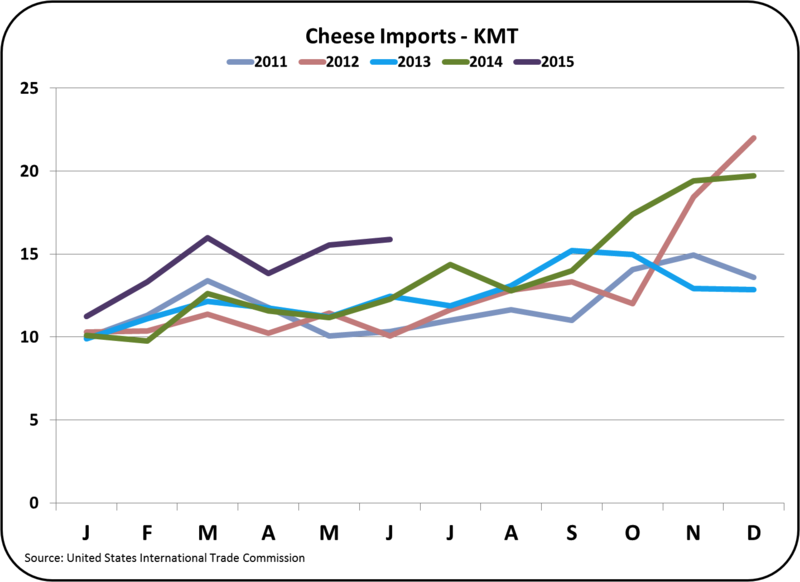 The decrease in 2015 cheese exports amounts to 61 million pounds (July estimated) or 42% of the increase in inventories. The combined impact of lower exports and higher imports are responsible for 61% of the increase in cheese inventories during 2015. The higher cheese inventories, which will result in lower cheese prices and lower Class III milk prices, are coming from international events. It would appear that unless cheese production is quickly lowered, lower prices are inevitable. 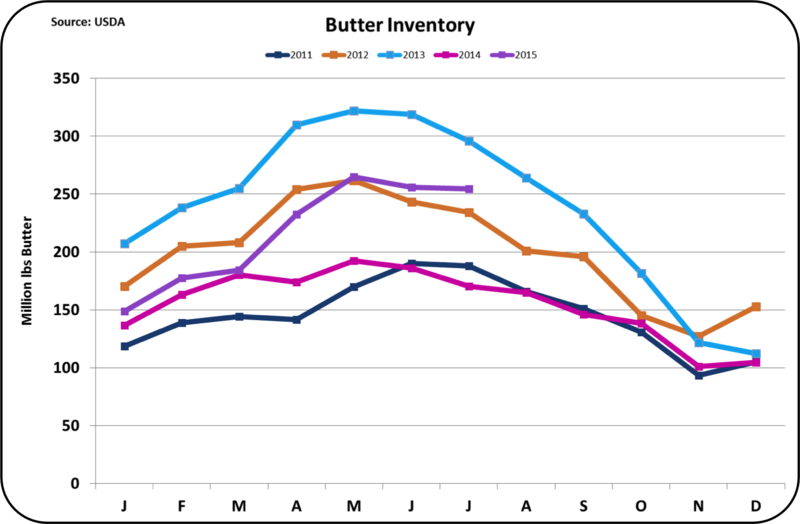 Butter inventories are also showing growth, but not to the extent of cheese. 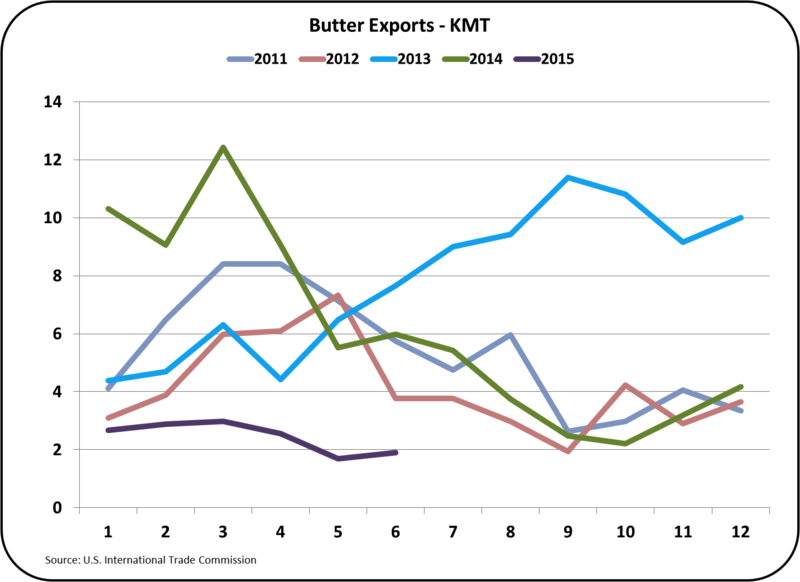 Very little butter is being exported, but imports are increasing to recored levels. As mentioned in the prior post, the U.S. is now a net butter importer. 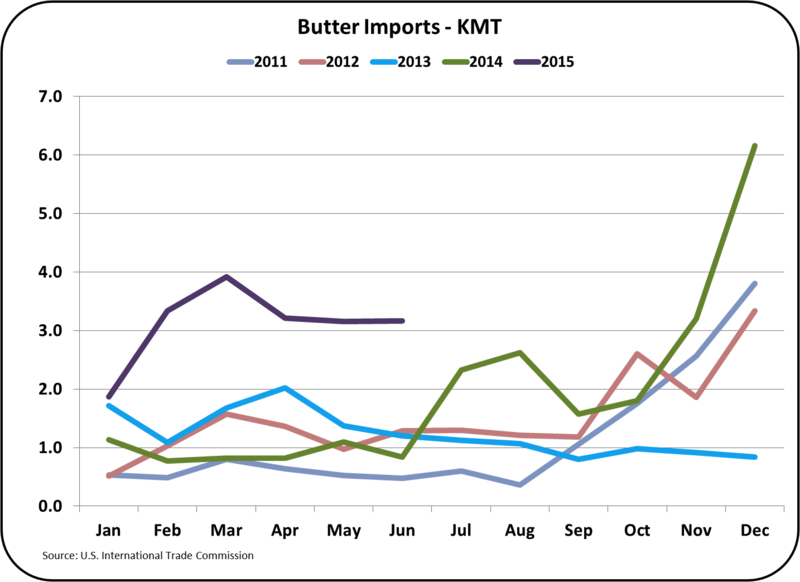 For the first seven months of 2015, imports of butter from New Zealand have increased by 962 metric tons from 202 metric tons to 1164 metric tons. Butter imports from France increased by 495 metric tons. 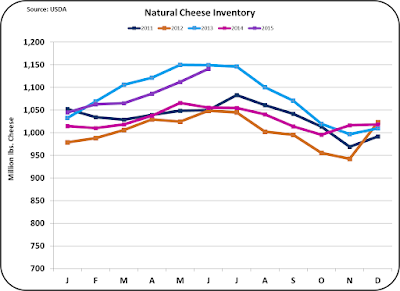 These increases are not as dramatic as the increase in cheese inventory and butter prices have a minimal impact on the Class III price, but the upward creep in inventories will continue to be watched. Dairy is an international business. There are always some who would like to close the door to exports and imports, but this is usually not a practical solution. Most all commodities are becoming internationalized and the dairy industry must learn to work within this evolving trend of international competition. Volatility will increase because more variables can impact milk prices. Being a low cost producer is paramount to survival. 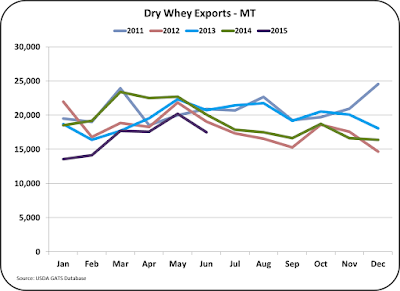 June export/import data reflected the softness in the international dairy markets. Exports volumes and prices were down significantly. There are three major reasons behind this: Russia has extended their embargo of dairy products for another year, China has significantly reduced dairy purchases, and the strength of the USD has made U.S. dairy products less competitive in the international market.. The most important dairy commodity for U.S. milk pricing is cheese. (See the April 23, 2009 post to this blog.) 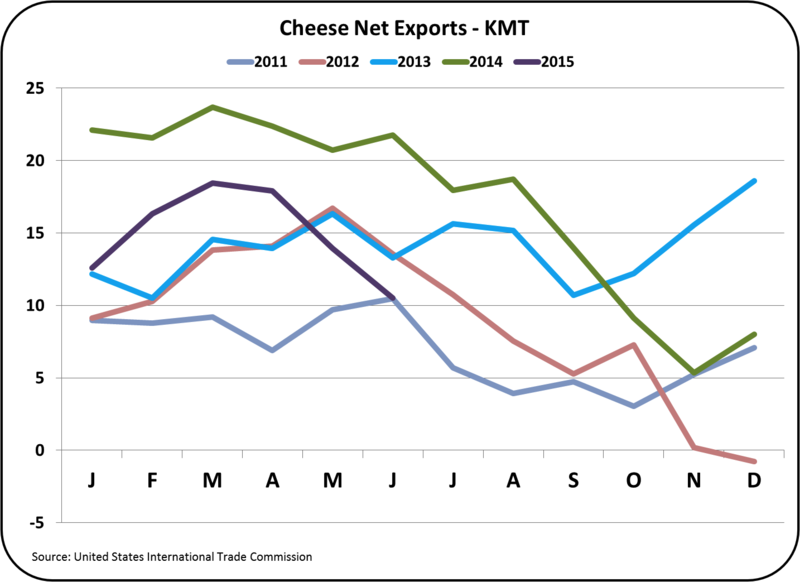 Cheese exports have been near prior year levels for the first five months, but in June, volume fell significantly. 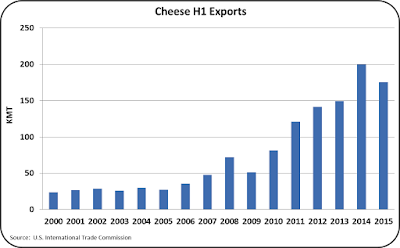 The chart below shows the healthy growth of cheese exports from 2009 to 2014. In the first half of 2015 they have taken a major dip. This chart below is for cheese, but most other dairy export charts are similar. 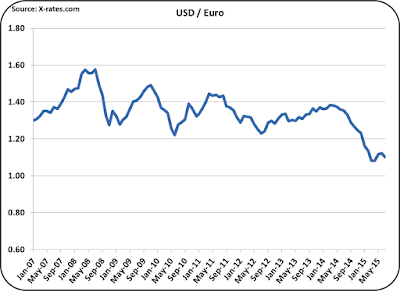 Exchange rates between the USD and other major dairy exporters are shown in a later section. The strength of the USD has given other cheese exporters like the EU a 20% price advantage compared to early 2014. Additionally, major cheese importers like Mexico, South Korea, and Japan have experienced exchange rate differences also in the area of 20%, which means that they could pay less buying elsewhere, or if they need a certain U.S. cheese, they will have to pay a significantly higher price that could reduce local consumption. The chart on cheese exports is alarming. 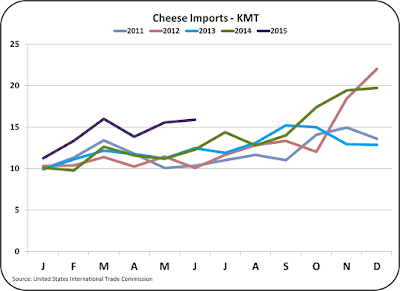 In February, March, April, and May cheese exports were only slightly behind 2014 levels. 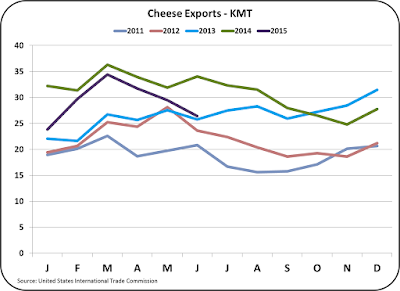 In June, cheese exports fell significantly below the prior year. 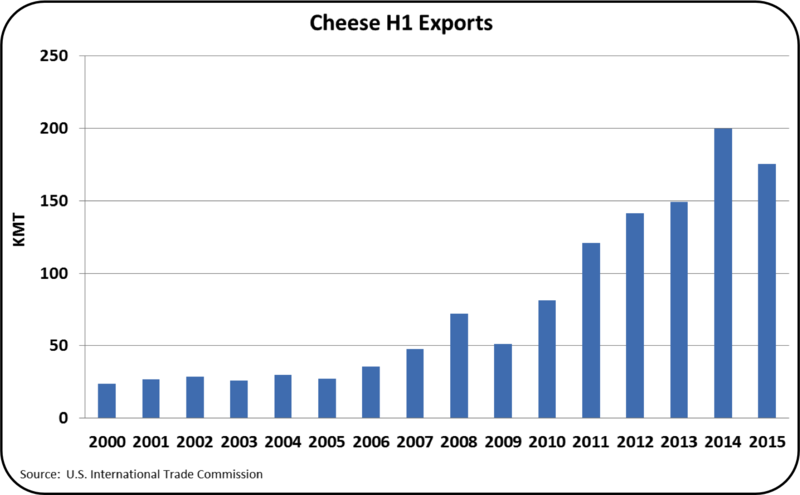 The opposite side of the export picture is cheese imports, which are at record levels and well above prior years. Typically cheese imports show strength only at year-end as specialty cheeses are imported for the holidays. The growing level of cheese imports currently suggest that commodity cheeses are gaining an international focus as demand from U.S. processors and distributors can be satisfied with less expensive imports. 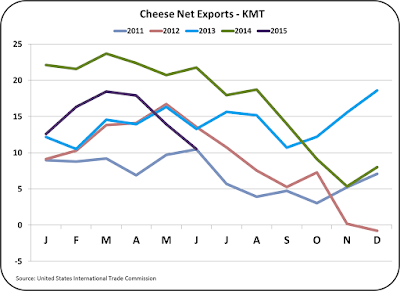 Net cheese exports (cheese exports less imports) show a decline to 2011 levels in June. Any continuation of this trend could really upset domestic inventory levels and thereby upset Class III milk pricing. 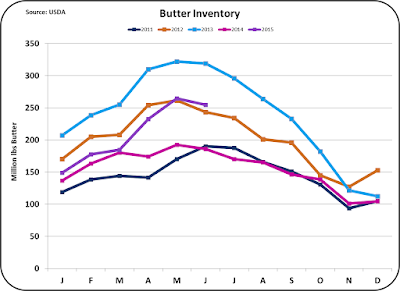 Very little butter is available for export as domestic churning has slowed considerably. 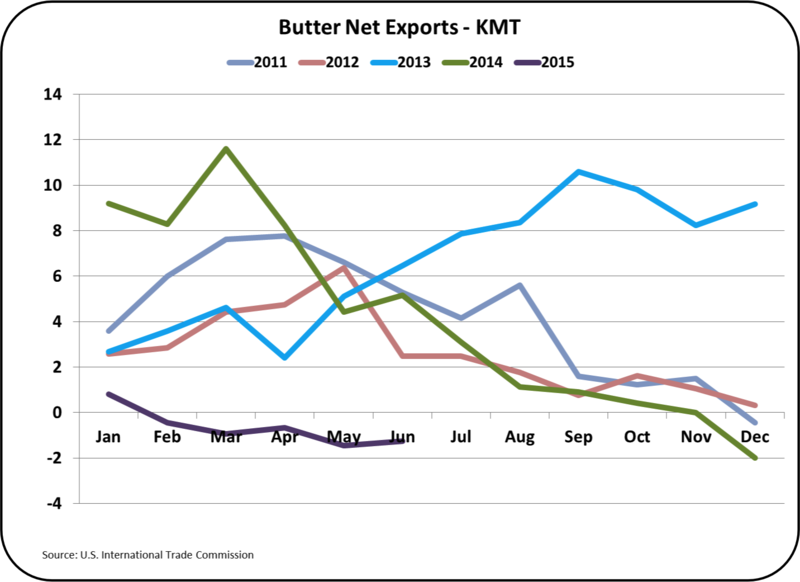 Butter exports each month have been lower than any of the prior four years. 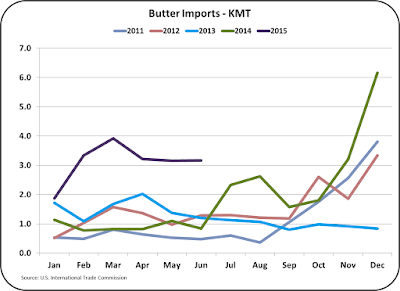 Butter imports have grown to record levels. This trend started in late 2014 and continues in 2015. 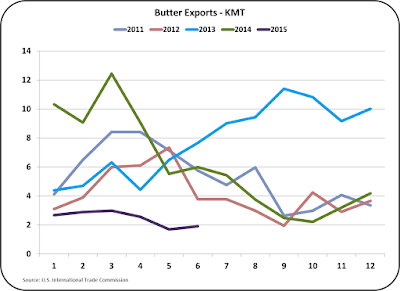 For more information on butter export activity over the last two years, see the June 7, 2015 post to this blog. This has made the U.S. a net importer of butter for the last five months. Low cost butter, which is very much a commodity, is available on the international markets at prices lower than the domestic markets. The only logical conclusion is that U.S. butter prices are likely to decline quickly in the coming months. This will result in lower producer prices for butterfat and higher prices for milk protein with very little impact on the Class III price. 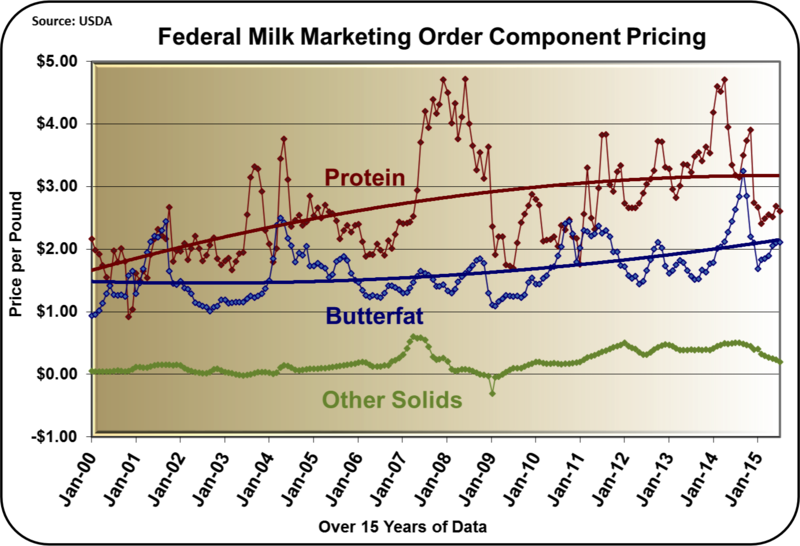 For more detail on the mathematical relationship of the pricing for butterfat and milk protein, see the August 8, 2010 post to this blog. Dry whey prices are the basis for the pricing of "Other Solids" in the component pricing system. Dry whey is primarily an export item. However, these exports are now at a five-year low. This will likely cause an increase in inventories and a drop in price for dry whey and therefore a drop in the value of "Other Solids." NONFAT DRY MILK EXPORTS AND IMPORTS. 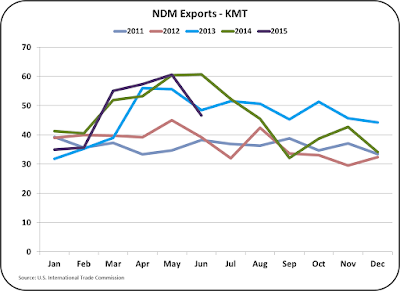 Exports of nonfat dry milk/skim milk powder (NDM/SMP) have traditionally been dominated by EU exports. However, in 2013 the U.S. passed up the EU to become the largest exporter of NDM/SMP. 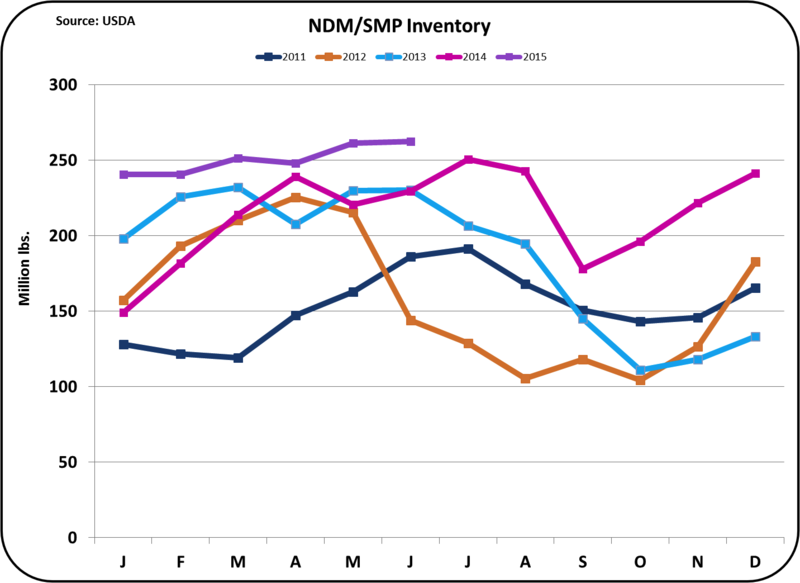 In 2014, the EU came back to take the lead again and in 2015 the EU is expected to export record amounts of NDM/SMP. NDM/SMP is an export item affecting primarily the western states. In June, exports took a plunge. NDM is used in the U.S. primarily to increase protein levels for cheese and yogurt production. Throughout 2015, imports have been a record levels. 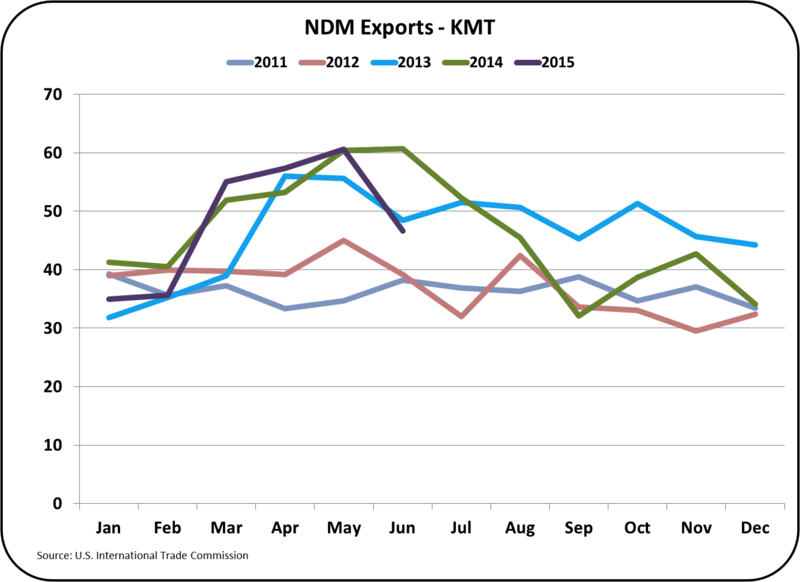 The combined drop in exports and the increase in imports of lower priced NDM suggest a continuing decline in the price of NDM. NDM is the basis of Class IV Skim pricing and thereby impacts the the uniform milk price used for determining the producer price differential. See the July 14, 2014 post this blog for more detail on this relationship. 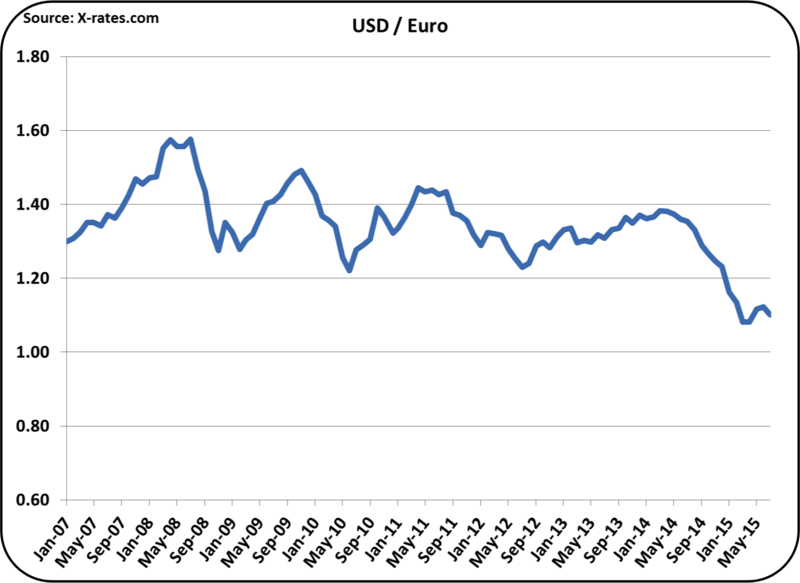 A stronger USD results when the international financial community sees the U.S. as financially healthy and a safe place to park funds. This sounds good, but it can have a devastating impact on exports. The two charts below show the USD vs. the two biggest competitors (the EU and New Zealand) in the global dairy markets. 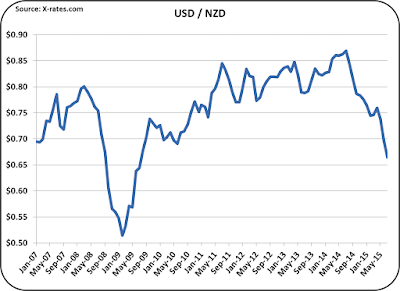 The big drop in the NZD in 2008 caused producer milk prices to fall from $20/cwt. to $10/cwt. As mentioned in the prior post, exports to Japan, one of the biggest importers of U.S. cheese, saw exports fall 51% in June. 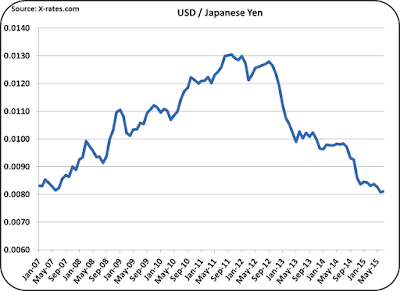 a quick review of exchange rate shows what's behind this drop. Exchange rates can significantly impact dairy pricing. The U.S. dairy industry has so far largely avoided the international turmoil in dairy markets. Unfortunately, that seems to be changing. The next post will focus on the most recent inventories of the commodities behind milk pricing. The developing impact of exports will also be closely watched. On August 5, 2015, July Milk Class and Component Prices were announced. The Class III price was down 2.3% at $16.33/cwt. Inventories of the commodities that are used to determine component prices were all up, primarily due to weak exports in a difficult international market. Higher inventories typically result in lower future prices. The international markets have been difficult throughout 2015 due to a significant decrease in imports from China and Russia. 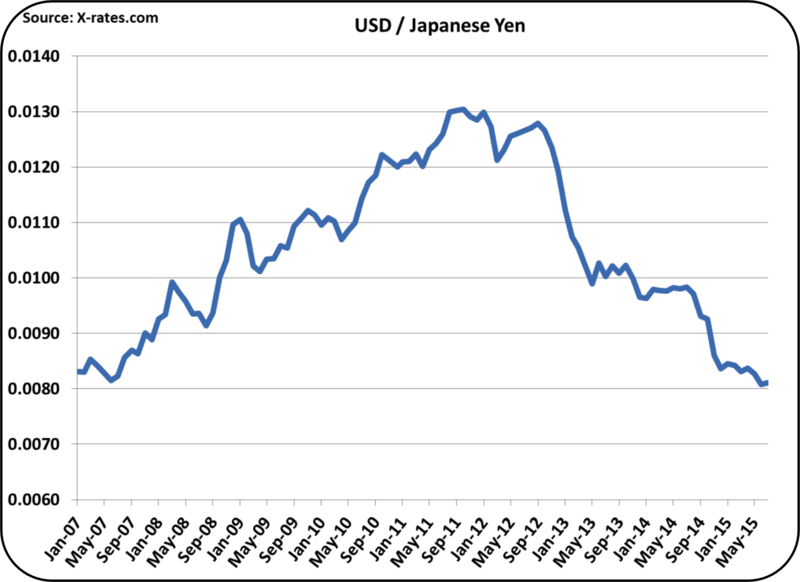 Additionally, the strong USD has made the U.S. Dairy products less competitive in the international marketplace. U.S. exports have held up well in this environment, but the recently released June export data shows significant decreases in export volume and prices. The decrease in exports is leading to higher U.S. inventory levels. The body of this post will primarily review inventories of the commodities used to price the three components that make up the Class III milk price. Those commodities are cheese, butter, and dry whey as they are valued by NASS. The long-term trend chart below reflects these events. The only higher price was butterfat, and it is up only by .5%. 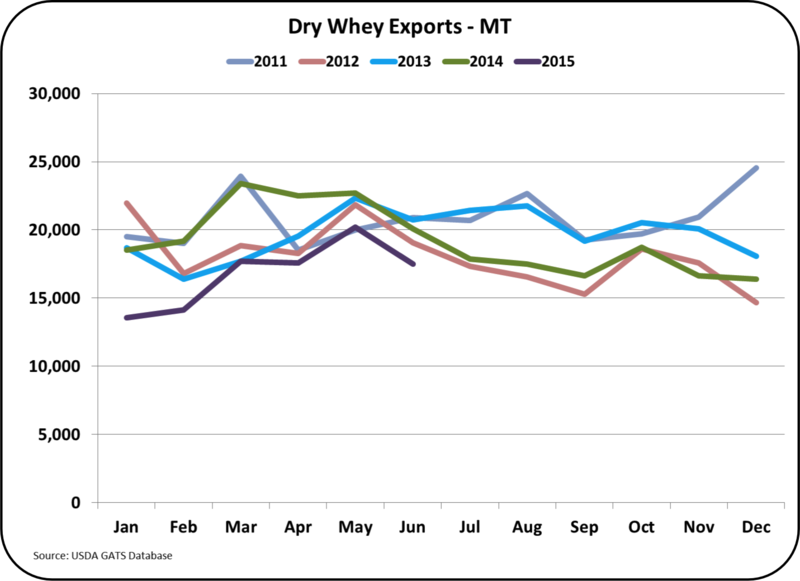 Protein was down 3.1% and other solids which is very dependent on exports was down 13.7%. 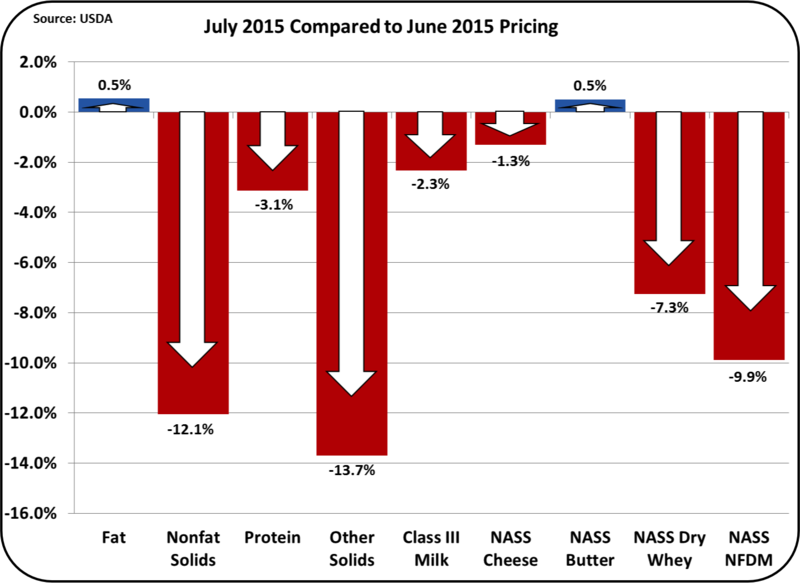 The long term trends continue to follow pricing that would make protein worth slightly over $3/lb. and butterfat worth slightly over $2/lb. As reviewed in a prior post, the most important dairy commodity for Class III pricing is cheese. The largest export market for U.S. cheese is Mexico and exports in June were up 20% vs. the prior year. (See the May 10, 2015 post for discussion on this market.) Unfortunately, exports to South Korea and Japan were down 36% and 57% respectively, resulting is a 22% overall drop in cheese exports vs. the prior year. In next post to this blog, the export markets and trends will be reviewed in more detail. Wholesale inventories of the commodities used to price components were above prior year levels at the end of June. They were generally not overtly high, but the trends were consistent and concerning. High inventories will make the commodity prices fall, in turn reducing the value of components. 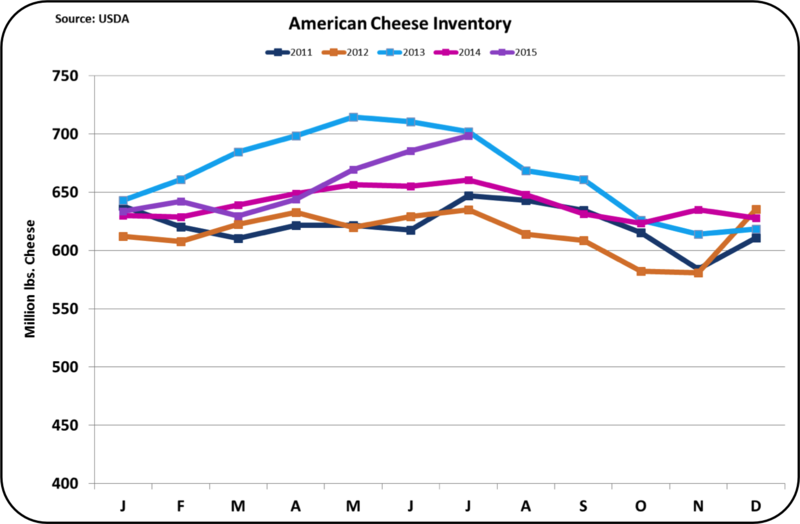 Cheese inventories for both natural cheese and American cheese were up. The most concerning was the inventory of natural cheese. It is near record levels. July numbers will be out soon and they could reflect a record level for these stocks. As the data becomes available, it will be covered in this blog. 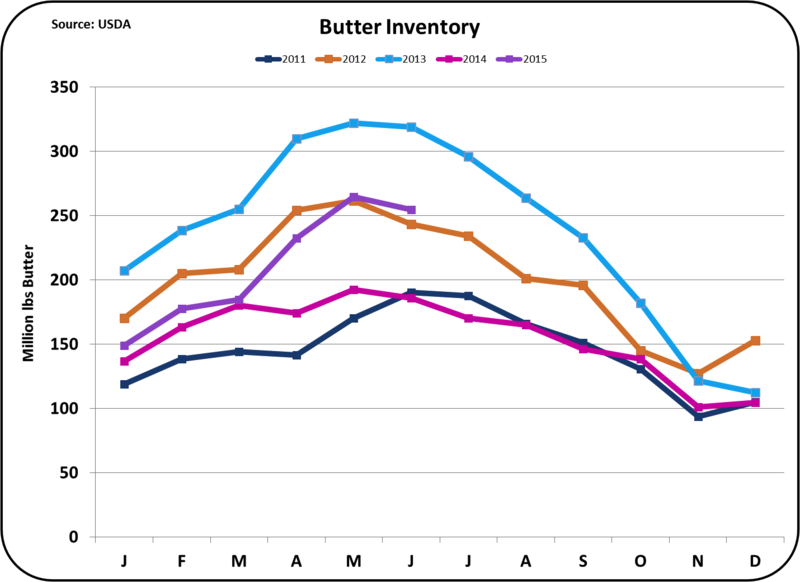 Butter inventories are also high as compared to the prior year, and are at the second highest level ever for the end of June. 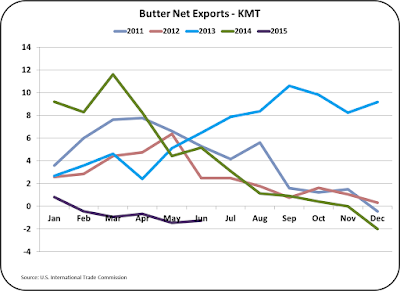 Butter exports have been very low for several months because there has been very little butter available for export. Therefore butter pricing has been influenced primarily by domestic consumption. Butter churning is below the prior two years and this is keeping inventories in check. Currently more butter is being imported than exported making the U.S. a net butter importer. More on this will be reviewed in the next post to this blog. 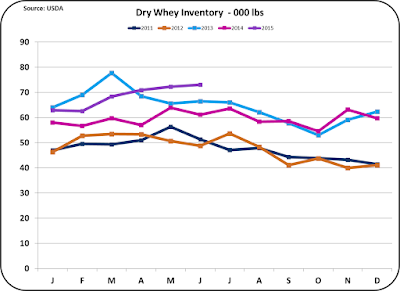 Inventories of dry whey are at record levels. Dry whey prices determine the value of "other solids" in milk. Dry whey is primarily an export item and exports and prices are determined by international conditions. As shown in the long-term trends chart above, the value of other solids has been dropping consistently in 2015. This appears to be a trend that will continue in 2015. 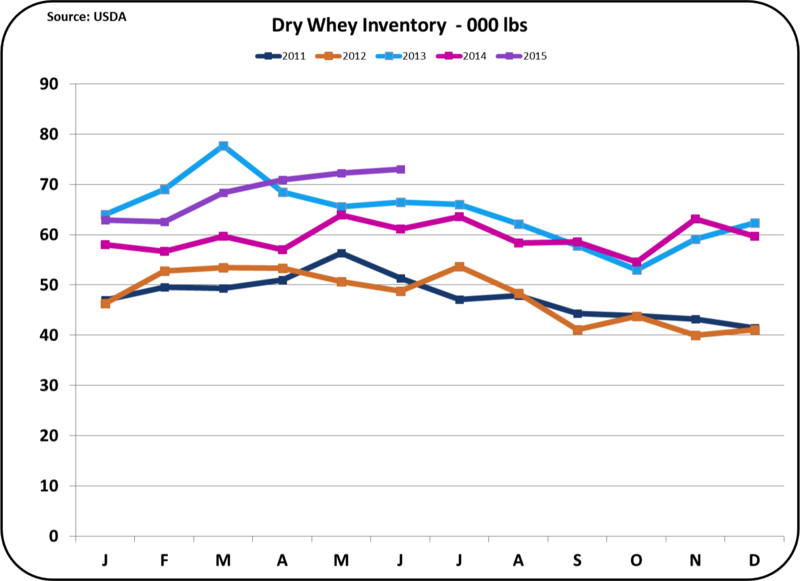 The inventory levels of dry whey shown below indicate that lower prices will likely continue. 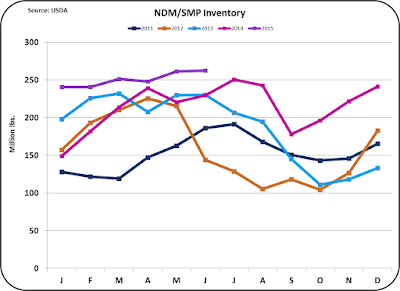 Nonfat Dry Milk (NDM) is not used to calculate component prices. However, it is the basis of the nonfat solids price and in turn, it is the basis for Class IV Skim milk pricing. Class IV pricing does determine the Class II price and can influence the Class I price. In turn, this influences the producer price differential for producers paid on the component system and directly influences the price producers paid on the advanced system. 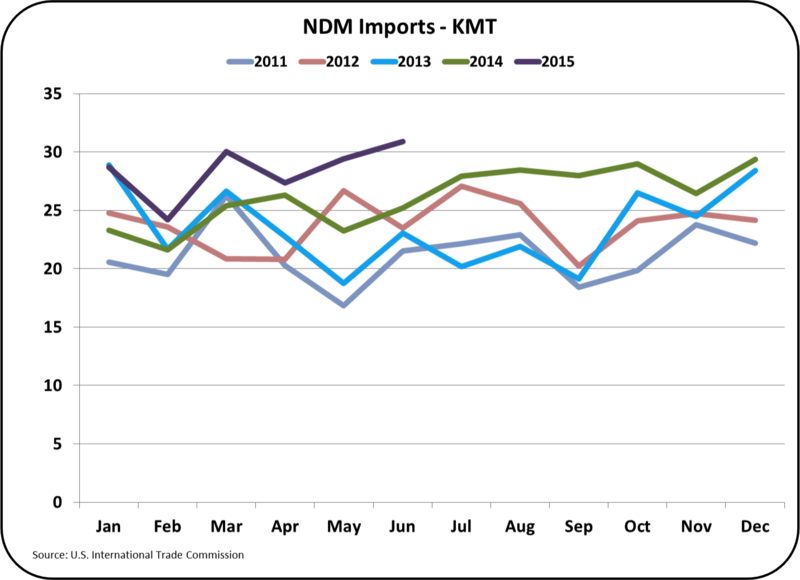 NDM is the largest export item for the U.S. Exports in June were down 23% from the prior year. 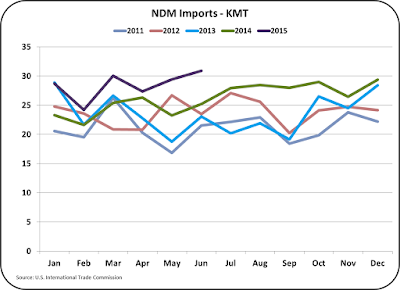 Approximately 50% of NDM is exported, so a downturn in exports significantly increases inventories. As seen below, these inventories are now at record highs. The international price for NDM is very low. U.S. exports to China are down 51% vs. the prior year. More details on this market will be explored in the next post to this blog. The U.S. dairy market is entering a period of turmoil. Some economists are forecasting lower prices for U.S. milk and other are seeing recovery by Q4 of 2015. The CME futures market is showing no drop in cheese prices through the end of 2015, but it is showing a drop below $16/cwt. for Class III milk. Cheese prices and the Class III price are closely linked via the formulas used to calculate component values, so the difference in trends is unusual. In the next few weeks additional posts to this blog will be made to review the most current dairy import and export data and the most current updates to the inventories reviewed in this post.